i am the new guy. The last 2 days i played around with turnkey in virtualbox a little. I did sucuessfully get suitecrm and dokuwiki running in a turnkey core 15 (as i wanted the current program versions). I simply followed existing tutorials on howtoforge. On your candidate list i saw openproject and also wanted to give this a try with turnkey core. As openproject is a redmine fork i already looked to see if i can find a solution there - but no success. The installation works fine - but when it comes to configuring i can see my lack of it-knowledge. There is a Ubuntu Howto for that where you can see the configuration - with the screen showing my problem. At least that is what i think the reason for not-working is. As i am installing this in a virtual machine via virtualbox so maybe i can later on use it with another virtualization solution i am not really sure what to enter there. For other programs my idea would be localhost - but trying this or 127.0.0.1 doesn't work. After entering e.g. localhost the installation goes on without errors - but i can't find out how to access the vm-installation in my browser afterwards. The normal way - entering the ip showing on the Core appliance services doesnt work. Do you know a way around or can give me a hint? TBH, I have no experience with openproject, but thanks for sharing. It looks relatively straight forward to set up so may be a fairly easy one for us to add?! 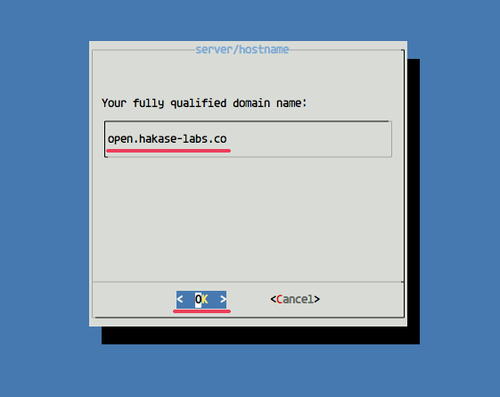 The "proper" way to do this is to register a "proper" FQDN (Fully Qualified Domain Name) and use that. Obviously for testing purposes that's overkill and probably undesirable. The next best way to resolve it would be to run a local DNS server and configure that to provide a local domain (.local used to be the "go to" local domain, but since Apple devices become popular, to avoid issues, I usually use .lan these day). But again, unless you already have a local DNS server set up, this too is probably overkill. The first is to just try with the accessible IP address of the VM itself. E.g. if you access the the Core server via IP address 192.168.1.100 (for example) then use that IP instead of a FQDN. The other alternative is to use a "made up" FQDN and then adjust your local machine's hosts file to point the desired FQDN to the accessible IP address of the VM. Note that you'll need to do this on every machine which you want to connect to your VM from. And each OS does it differently. Depending on your OS and version, you'll need to do some googling. E.g. for Windows 10, try googling for something like "add entry to hosts file windows 10" and you should find plenty of good instructions.